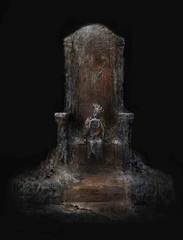 Also known as Ludleth the Exiled, he sits on one of the five thrones at Firelink Shrine. He claims to have linked the fire long ago, becoming a Lord of Cinder, but he is now a charred cadaver. If you attempt to kill him, he will fall. But if you travel away and return, he will be where he was, alive. 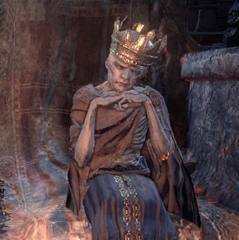 After returning all the Lords of Cinder to their thrones and speaking to the Fire Keeper, she will summon their power to become yours. This includes Ludleth, who will die in flames where he sits. Firstly, all the thrones seem custom made for their Lords, but Ludleth is clearly undersized for the one he sits on. When killed, Ludleth drops the Skull Ring, one of his transposed wonders, derived from the soul of a Soulfeeder, a beast that insatiably absorbed souls to feed its own power. He does not drop a large soul of his own, nor does the game declare 'Heir of Fire Destroyed'. Ludleth isn't burned because he linked the fire long ago, and he doesn't want you to go out and return with the souls of the Lords of Cinder because he truly believes in the Linking of the Fire. He is the Soulfeeder; his body is burned because his corpse was burned (perhaps even making him an Unkindled like yourself, having returned from the grave) and he wants you to bring back the Lords of Cinder's souls so that he can once again rise to power. 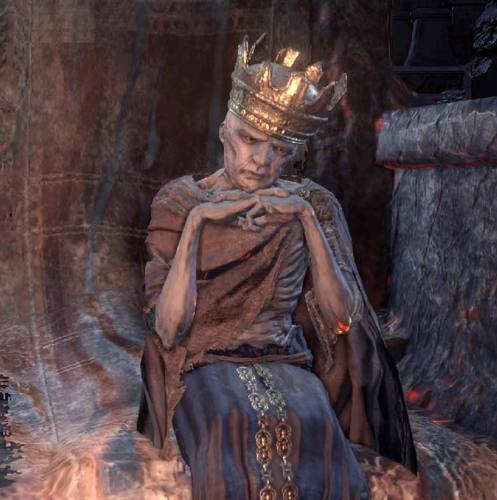 Alternatively, Ludleth was not the Soulfeeder in Courland, but the Soulfeeder was basically a Lord of Cinder itself, though it did not link the fire. So, the Soulfeeder was basically Courland's Chosen Undead. It went around devouring souls, leveling up at the Firekeeper, etc. Meanwhile, Ludleth was simply soul-smith, like Ornifex. When it was time to link the fire, the Soulfeeder refused, betraying the Firekeeper by outright refusing to complete his duty in spite of all the soul's he consumed for power. Her visions of the end of this age refer to this specific age of Dark Souls 3, where the Lords of Cinder are abandoning their thrones, much like the Soulfeeder abandoned his throne. Eventually, Ludleth took action and slew the Soulfeeder, then transposed it's great soul into an item rather than trying to consume it himself. Ludleth then took it to link the flame, burning with it. The previous Chosen Undead, most likely Lothric, was destined to link the fire. However, with help from his brother, Lothric refused to fulfill his duty and abandoned Firelink Shrine to the darkness. In Ludleth's original time, this must have completely doomed the world to darkness, but Ludleth, somehow, managed to give himself and the world a second chance by casting himself on to whatever embers remained of the First Flame. This act appears to have created a point in time where Ludleth can influence events to fix what went wrong with the past Firelink Shrine. If you notice, the Firelink Shrine that you awaken at is in the same location as Dark Firelink, but Lothric isn't there. However, the Lothric that you travel to is in a world that is on the verge of darkness. The flame hasn't completely died yet, but the shrine is so dark that it's starting to consume the rest of the world. The Ashen One, awakened to hunt the Lords of Cinder, has apparently been tasked with saving the world by Ludleth's actions. However, as with all things regarding time travel, things start getting muddy when you throw in a variable such as the Ashen One. When you think about it, Ludleth seems to have created a Mobius Strip by making himself a Lord of Cinder. He has opened a point in time where the Ashen One can travel to a pivotal point and right a past wrong. However, depending on your actions, this may change nothing or save the world. "Oh, thou'rt Unkindled, and a seeker of Lords. I am Ludleth of Courland. Look not in bewilderment as I say. I linked the fire long ago, become a Lord of Cinder. If substantiation be thy want, set thine eyes upon my charred corpse. This sad cadav'r. No need to be coy, have a closer look." "Knowest thou of our purpose? Five thrones will take five Lords, as kindling for the linking of the Fire. The fast fading Flame must be linked to preserve this world. A re-enactment of the first linking of the fire. So it is, I became a Lord of Cinder. I may be but small, but I will die a colossus. "Ah-hah, thou'rt returned. And a fine day it is. So, happened upon any twisted souls?" "Oh, belike it is…a transposing kiln in thy possession. Seen better days, but, methinks it shall suffice. Now, bring to me a twisted soul. Transposition is the art of extracting, and coalescing, the essence of a soul. In transposing a twisted soul, its true power transferreth to thee. Thy purpose is to seek Lords, and slay them. What's to fear in a little transposition, now?" "Ahh, well met. Thou'rt at last returned. Knowest thou the name, Anri of Astora? The brave girl left this, as thanks. "Now, heed this little warning, from this little lord. She knoweth her fate. What will become of her upon her duty's end. She would not wish thee follow her." "Scenes of betrayal, things never intended for her ken, visions of this age's end. Treat the fire keeper not with discourtesy." "Speak with the Fire Keeper. She awaiteth thee. She hath waited a long time indeed." Ahh, beg pardon. I must have dozed a while. Fret not, fret not, my feet are here, firmly planted. For I am a lord, and this is my throne." One of Courland's transposed wonders. Derived from the soul of a Soulfeeder. Easier to be detected by enemies. The Soulfeeder was a beast that insatiably absorbed souls to feed its own power. Even after its accursed corpse was burned, it is said that the pungent stench of souls left the air permanently stained. An old transposing kiln from Courland, crafted with stitched crystal lizard hide. Give to Ludleth, Lord of Cinder, to conduct soul transposition. This kiln can transpose twisted souls to craft special items with their concentrated essence. Deemed forbidden by those unable to make proper use of it. What if the Player/Ashen One is the Soulfeeder? Alot of people pose the theory that Ludleth is the Soulkeeper. However, what if WE, the Ashen One/ Unkindled, are the Soulkeeper resurrected?! First off, we know that when someone links the flame, they become "kindling" to the flame and become a Lord of Cinder. That being said, as the Unkindled, to me that sounds like we, at some point in the past, REFUSED to link the flame and therefore didnt becoming "kindling" to the fire (hence, Unkindled). That would explain the opening scene's line about "accursed Undead unfit to be cinder" (we didnt become a Lord of Cinder). Ludleth complicates things a bit. Through his dialogue, and even more importantly, the ring he drops when killed, brings me to this theory. WE are the Soulfeeder reincarnated. Ludleth hints at two important things in his dialogue: 1) that he WILLED himself to be a LoC and 2) when talking about the Untended Graves, that Dark Age was brought on by betrayal. What if the Soulfeeder was Corland's Chosen undead destined to become a LoC, betrayed his duty, and became the first to let the fire fade (I say "first" because I dont know if there has been a Dark Age since Gwyn linked the fire. If the Soulfeeder was not the first to let it die, it doesnt really affect my theory). Ludleth, who was a master soul transposer also from Courland, tracked him down, killed him, and turned his soul into the ring. Ludleth then threw himself, with the ring, into the fire (thus, "willing" himself to be an LoC). Note: Alot of people claim that if you kill Ludleth, it doesnt say "Lord of Cinder" destroyed. I think that's a game mechanic thing because if you reload at a bonfire he shows up again. Now, what if the "punishment" for refusing to link the fire caused the Soulfeeder to become an Unkindled "bounty hunter" cursed with tracking down other LoCs who are on the same path. Sort of like a second chance at redemption for us. As the opening states, "Ash seeketh Embers." We were killed and became ash and long for redemption by linking the fire and becoming embers. As we know at the beginning of DS3, the "link to fire is threatened" because Lothric refuses to link the flame. So the firekeeper rings the bell to wake the old LoCs to save the fire (second line of defense) but they refuse too. Finally, we, the Unkindled, rise as the last line of defense to hunt down and MAKE (via violent means) the LoCs return by taking their souls and linking it ourselves or, once again, deciding not to. To sum up: In another time, we were the Soulfeeder and were tasked with becoming an LoC. We betrayed that duty, were killed by Ludleth, and he became an LoC instead. As punsihment for our betrayal and as an opportunity for redemption ("Ash seeketh embers") we became the Unkindled, a being tasked with hunting down anyone/thing who chooses to follow us on our path and not link the flame. - Ludleth's throne clearly wasn't made for him, like all the other thrones were custom to their LoCs. It definitely seems more fitted for us. - After we refused to link the fire, the firekeeper had a vision of what would happen if the fire died. She showed this vision to Ludleth which, fearing this prophecy, caused him to kill us (the Soulfeeer) and throw himself into the fire to link it.